If you eat nutrient-poor, unbalanced, processed food, your energetic vibration will be drastically reduced. You will feel tired, maybe a little sad and discouraged. The people you interact with will feel your low energetic frequency (even if they don’t know what that is). You will struggle to attract the things in your life that you desire and, over time, a heavy density will grow around you. But, if you choose nutrient-dense, balanced, fresh, gorgeous, colourful, vibrant foods, it’s like a supercharge for your energetic frequency. You feel alive, awake, in tune with the universe, and people around you notice your glow. You find that you easily and effortlessly attract the things you most desire and the density evaporates. 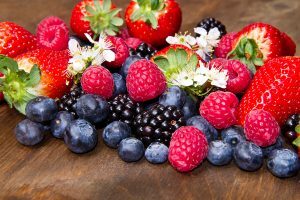 All fresh fruits are fabulous and will boost your vibration, but berries are at the top of my list for a few reasons. They’re low in sugar which is great for people struggling with unbalanced blood sugar, which is almost everyone. 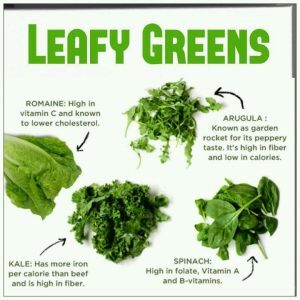 They’re also super high in antioxidants which help boost your immune system and reduce inflammation. You can sprout almost any seed, bean or grain. It’s easy to do and can be done right on your kitchen counter! 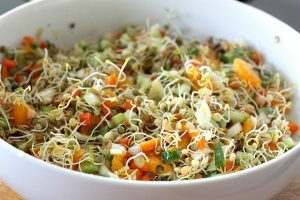 Sprouts are super high in protein (up to 35% of a sprout is protein) and rich in enzymes which help your body do all of the amazing stuff your body does. Sprouting also gives beans, seeds and grains an extra health boost by neutralizing the phytic acid in these foods. Phytic acid is an element that binds with nutrients so that your body can’t access them! So basically the seed is Clark Kent and the sprouted seed is Superman! 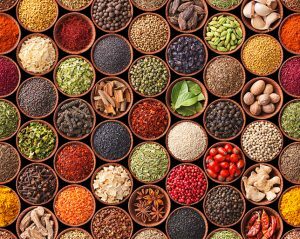 For thousands of years people have been using spices as a delicious way to raise the energetic vibration of food. Turmeric, cinnamon, ginger, garlic and cayenne all contain powerful healing properties and help with everything from digestion to blood sugar balance and even arthritis! 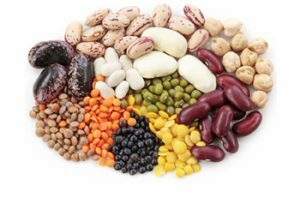 Beans and legumes are very high vibration foods because they’re nutrient powerhouses. The contain lots of protein, carbohydrates and fiber as well as lots of B vitamins and even iron. 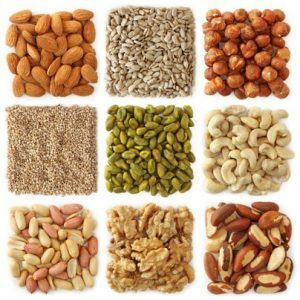 Raw, unsalted nuts and seeds also make the list of high vibration foods because they’re, not only are they a great source of protein and fiber, but they also contain healthy fats like omega 3s that your body (and especially your brain) need to function properly. I often recommend raw nuts and seeds to my clients as a great, healthy mid-day snack. Yes, I’m suggesting you eat algae. Don’t be afraid. 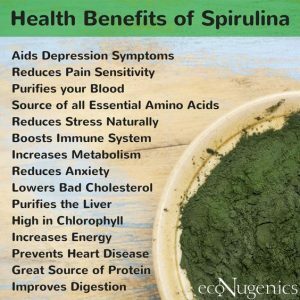 Blue green algae’s like Spirulina and Chlorella are among the most nutrient-dense foods on the planet which make them super high vibration. You can buy these dried at your health food store and add them to smoothies, or (if you can’t handle the taste) you can get them in tablet form and just take as directed on the label. Every day we’re learning more and more about the importance of gut health to our overall well-being. Your gut (digestive system) is home to a whole ecosystem of bacteria. 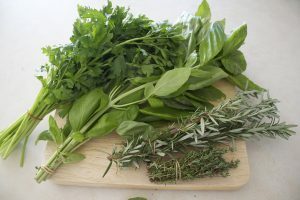 Some are “good” and help your body stay healthy and others are “bad” and – if allowed to overgrow – can contribute to many poor health conditions including allergies, eczema, joint pain, fibromyalgia, depression and even cancer. 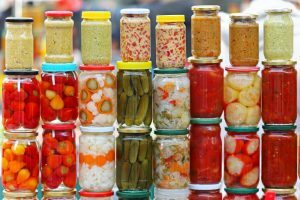 Naturally fermented foods like sauerkraut, kimchi and kombucha are teeming with the “good” bacteria you want and can help to address imbalances in that delicate ecosystem. 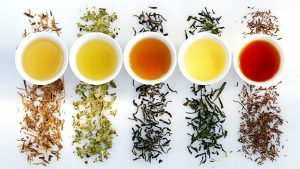 I love tea and I think that its many natural healing and health-promoting properties make it a very high vibration food. Green and white teas are full of powerful anti-oxidants to support your immune system and fight inflammation. Herbal teas like chamomile, valerian and passion-flower are calming and can help you relax and sleep better.